Somewhat astonishingly – especially for someone who has a regular feature entitled My Bad Travel Photo which highlights the usual travesties we manage to take – we were chosen as the winners of Travel Photo Roulette. We are now strutting about with our chests protruding prominently and proclaiming our genius with a lens to anyone who will listen. Last time around Tom and Kris Bartel of Travel Past 50 hosted the event around the theme of conflict or competition. As winners we now get to have everyone round to our place as hosts of Travel Photo Roulette #75. Okay, enough with the showing off. Travel Photo Roulette? What’s that then? Travel Photo Roulette is a competition started by Jeremy at Living the Dream way back in November 2010 as a way for travel bloggers to connect and share their photos. Most of our readers are interested in working or volunteering abroad so the theme of WORKING is the most obvious one for us. Even if you are not actively looking to work abroad the requirement that we need a blog – with all the effort that entails – to enter this competition means the contrast between working for a living back home and the freedom of the open road is a little more blurred for us all. This theme is open to interpretation (so hopefully we won’t get lots of pictures of people typing on their laptops). If you took a photo of one of the countless daily working lives we all pass through as we travel, please submit it to us here. 1. One submission per blog please. The contest will run until Midnight GMT, February 28, 2014, after which time we will ponder on who we will pick as the winner. We will announce the winner at the top of this post on March 3. Please note we do not have a comment moderation system – we let Aksimet deal with that – so if your comment doesn’t appear straight away Aksimet is being a little too aggresive. In which case contact me by the contact link or through Twitter or Facebook and I’ll fish you out of the spam folder. 1. Women run the local market in Hoi An, Vietnam. Here they are cleaning their bowls after the market has finished. 2. This man was working diligently on a wooden boat, using hand-made tools, beside the Ganges River, Varanasi, India. 3. This was taken in the Transylvanian countryside, Romania. 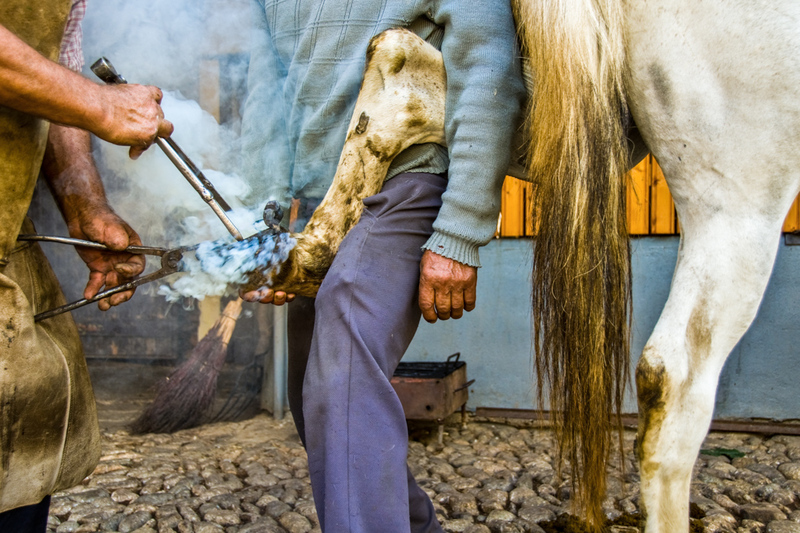 A traditional blacksmith and his assistant putting a hot shoe on a horse. 4. The village of Shirakowa-go, Japan is a Unesco World Heritage site. It used to be an isolated village that employed a unique style of thatched roof architecture to ward off the persistent heavy winter snows, and the town had largely fallen into disrepair. But, over the last decades, since being named a Unesco site, it has prospered from the resultant tourism and the residents have been working hard to restore the original beauty of their unique architectural style. As you walk through the town, you can see evidence of the restoration by skilled craftsmen working on several buildings. In this one, the woodworker was doing finish sanding on a piece of a screen that tops an interior wall. In addition to the lovely simplicity of the cut out design, the screen allows airflow between interior spaces. 6. Wood Carving in Bali (One of our many stops on our Bali Eco Cycling Tour). .
7. Israeli teen soldiers in Jerusalem take a break from patrolling the streets in front of the Yad Vashem Holocaust History Museum. 8. Here’s my entry from one of my favourite places, Hoi An, Vietnam. This old woman had set up her stall and was selling clay whistles at the side of the road. 9. 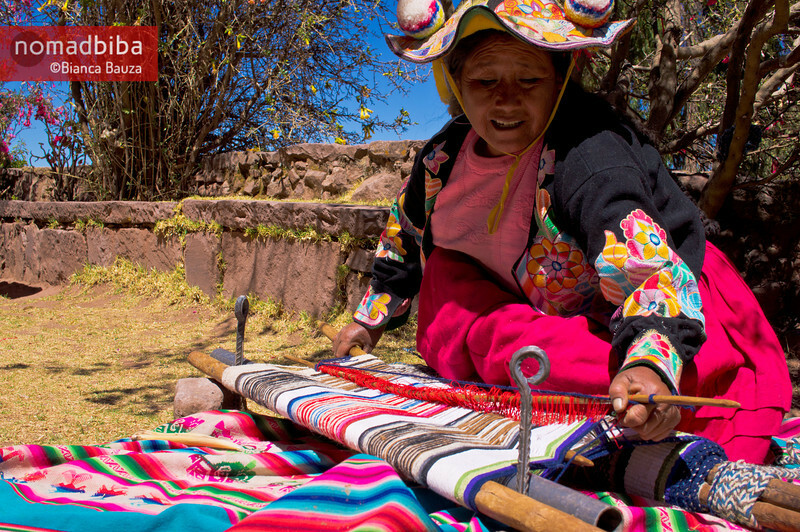 To this day the women in Capachica, a peninsula on the Peruvian side of Lake Titicaca, weave beautiful and colourful textiles with the same techniques that have been passed on from generation to generation. Their work is precious. 10. Taken in Vietnam while trekking in the hills of Sapa in the North. I was lucky enough to capture this shot of a man surveying the rice paddies, ready to get to work by the looks of things! 11. One of the hardest working guys out there is the Zulu King’s Press Secretary. It is his job to go out an hour before the King appears and shout the good virtues and accomplishments of the King. In the heat of the day, and at the top of his lungs, this guy works! 13. Motorbiking around the southern tip of the Vietnamese island of Phu Quoc, I came across “the shack doctor.” My sheer fascination with his apparently primitive methods helped me overcome any fears of being a nosy tourist to snap this memory of his shockingly different medicinal style. 14. A market vendor uses a homemade blowtorch to cook a python at the Tomohon Traditional Market in North Sulawesi, Indonesia. 15. Here’s a classic blogger-in-a-hammock photo. I’d rather be surfing. 16. This is a ranger and sled dogs at Denali National Park – the only US park to have working sled dog kennels. Snowmobiles aren’t allowed in protected areas, so dog teams resupply the remote ranger cabins in winter. 17. A mother and son street performer team in Gdansk, Poland. 18. This woman is putting the finishing touches on a huge umbrella at the Umbrella Making Centre in Borsang Village in Sankamphaeng, Thailand. 19. This lady is working or hardly working at the food market in Dalat, Vietnam. 20. We spotted this guy during our stay in McLeod Ganj in India – The guy standing was a denture (false teeth) repair man! He had his hand shoved fully into this poor guys mouth – no gloves needed! Although it looks like it, he didn’t have his thumb in the guys eye socket! 21. Why not take your work outside? This is a pretty good place for a shave! 22. Here are a few fine Parisian public workers trying to remove snow. They’re not quite efficient. 23. Street food in Yogaykarta was not always easy to come by, but luckily for us this fine gentleman served up delicious, blazing hot noodles nightly. Not only that, but they were the cheapest game in town. We’ll never cease to wonder at what can be done with a simple terra-cotta pot filled with charcoal and an electric fan. 24. Our entry is from one of the top lassi shops in Varanasi, India. It was a thrill to watch this man make the lassi drinks as he ground up and mixed in the toppings by hand using the method seen here. 25. This was from a snowy day in Zermatt Switzerland. Was walking through town and saw this guy getting ready for the work day. It’s not often you see a man pulling horses through the snow. 26. After a long day volunteering in the coffee fields of Colombia I was left with about 10 pounds of coffee berries, after removing the fruit, drying, and roasting all that will be left is about a pound and a half of beans. It makes me appreciate my morning cup more than ever. I didn’t work for the coffee itself, but for the experience, to talk with, and at least for a day, be a coffee worker. My time in the coffee fields is one of my highlights on our RTW trip to date. 27. Sometimes the people making our food go UN-noticed, and under appreciated. Every night Moses worked his high heat gas burner with a smile that radiated near as much as his flame, I always made sure to let him know how good his food was and thank him. I caught this one with a fast shutter, just as he rolled the sauce back into the pan. 28. I’m submitting this shot taken in Granada’s Parque Colon. After a day walking the streets of one of Nicaragua’s oldest colonial cities we sat in the central square to rest our tired feet and soak in a little more of the local culture. I sat watching this young girl selling her wares. She stood with such poise and took such pride in each sale. She hadn’t noticed us until the moment I took this shot when her gaze caught the lens of my camera. Women run the local market in Hoi An, Vietnam. Here they are cleaning their bowls after the market has finished. Thanks Denise. I remember seeing women doing their washing up in the river in Hoi An too. This man was working diligently on a wooden boat, using hand-made tools, beside the Ganges River, Varanasi, India. Thank you Tamara. I love boats myself but that one would sink if I were in charge of the repairs. Congratulation for winning the last round. This is our entry. Thanks for your entry Gianni. Romania took us a little by surprise – especially the contrast between the sophiticated capital and the very traditional countryside. The village of Shirakowa-go, Japan is a Unesco World Heritage site. It used to be an isolated village that employed a unique style of thatched roof architecture to ward off the persistent heavy winter snows, and the town had largely fallen into disrepair. But, over the last decades, since being named a Unesco site, it has prospered from the resultant tourism and the residents have been working hard to restore the original beauty of their unique architectural style. As you walk through the town, you can see evidence of the restoration by skilled craftsmen working on several buildings. In this one, the woodworker was doing finish sanding on a piece of a screen that tops an interior wall. In addition to the lovely simplicity of the cut out design, the screen allows airflow between interior spaces. Hi Tom, thanks again for selecting my photo last time around – I’m enjoying seeing everyone’s photos for this round. 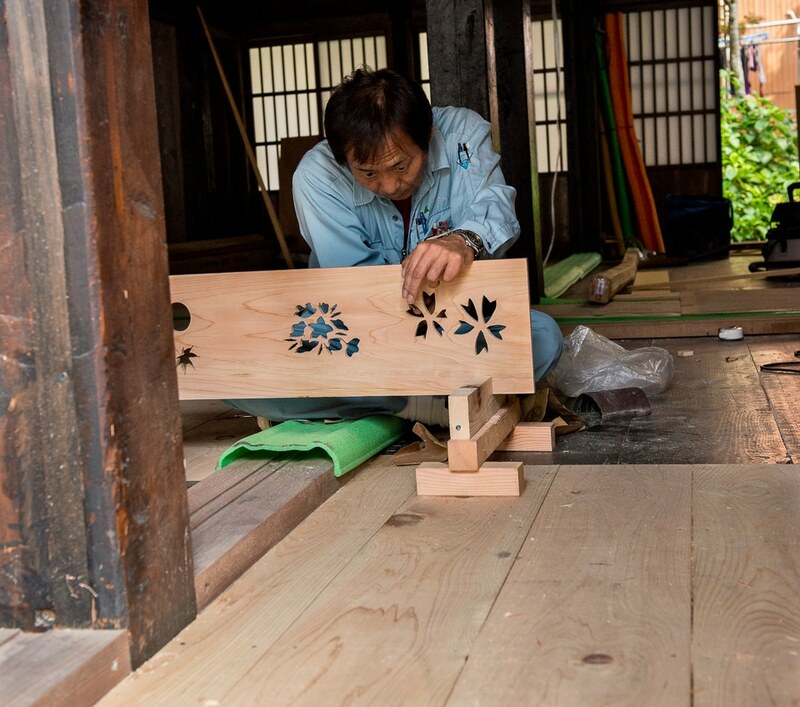 Great to see from your description that local craftsmen are benefitting from being chosen as a UNESCO site. Congratulations for winning the last round! My photo was taken on a night tour near Sydney in Australia. We had a photographer giving us tips during the whole tour: moonrise, light painting, photographing starts and sunrise. Thanks for your entry, Claire. It looks like you paid attention to the tips passed on by the photographer in your shot. Israeli teen soldiers in Jerusalem take a break from patrolling the streets in front of the Yad Vashem Holocaust History Museum. My blog is http://www.travelyourself.ca thanks! Congratulations on your win! Here’s my entry from one of my favourite places, Hoi An, Vietnam. This old woman had set up her stall and was selling clay whistles at the side of the road. Hoi An is a particularly photogenic place. This is our second shot from there. Thanks Suzanne. To this day the women in Capachica, a peninsula on the Peruvian side of Lake Titicaca, weave beautiful and colourful textiles with the same techniques that have been passed on from generation to generation. Their work is precious. I loved the colours on and around Lake Titicaca. Thanks for your entry Bianca. Great photo and congrats on winning. Definitely a compelling photo. Hopefully my entry here fits the bill of “Work” too. Taken in Vietnam while trekking in the hills of Sapa in the North. I was lucky enough to capture this shot of a man surveying the rice paddies, ready to get to work by the looks of things! I hope you like it. Thanks Matt. Were there by any chance a dozen or so people out of shot watching this man? I’ve noticed a phenomenon around the world where one man actually takes his turn to work with a shovel, while all his co-workers stand around offering encouragement, smoking and gossiping and otherwise doing sod all. If I recall correctly the highest ratio of watchers/workers was about 20 to 1 on a road widening project from the Chinese border to Sapa. Congrats on willing! Love that picture. It tells a story. One of the hardest working guys out there is the Zulu King’s Press Secretary. It is his job to go out an hour before the King appears and shout the good virtues and accomplishments of the King. In the heat of the day, and at the top of his lungs, this guy works! That’s so cool – I want one too. Though anyone banging on about my virtues and accomplishments for a living will have a much shorter working day. Thanks for the submission and telling us about this man. Thanks James. Reminds me of my secret shame as an Englishman who has never had a cup of tea. Motorbiking around the southern tip of the Vietnamese island of Phu Quoc, I came across “the shack doctor.” My sheer fascination with his apparently primitive methods helped me overcome any fears of being a nosy tourist to snap this memory of his shockingly different medicinal style. Thanks Dave. But, had it been required, would you have overcome your fears enough to have sought treatment here? Here’s mine: A market vendor uses a homemade blowtorch to cook a python at the Tomohon Traditional Market in North Sulawesi, Indonesia. Thanks for sending this, Raymond. I can’t help but notice the stall next door, which I assume wasn’t selling blow torch cooked python, is sold out. Oh god, I thought you were joking at first. Each to their own, I suppose. No worries, Eva. Enjoy your travels. I’ve always been partial to a blogger in a hammock photo. Thanks Matt. I haven’t entered before, but I love this category! This is a ranger and sled dogs at Denali National Park – the only US park to have working sled dog kennels. Snowmobiles aren’t allowed in protected areas, so dog teams resupply the remote ranger cabins in winter. Thanks Jess, and welcome to Photo Roulette. I used to share a flat with a husky. There was an abandoned shopping trolley nearby and I found out later each of the half a dozen or so people that lived there had at one time or another sat in the trolley and shouted ‘Mush!’ at the dog (who just ignored us). Oh, and I love your picture of the elephant washer, because I had never thought of that before but now it’s my dream career title. How could washing elephants NOT be fun? Some great photos, it’s really interesting to see the way people work around the world. I can see why yours won last time too. Thanks Andrew. I’ve always been fascinated with work. I can watch other people doing it for ages. We’d like to enter our shot of a mother and son street performer team for the “working” round of photo roulette! We are glad you did. Thanks Kerri. This woman is putting the finishing touches on a huge umbrella at the Umbrella Making Centre in Borsang Village in Sankamphaeng, Thailand. Thanks Carole. I so want the really massive cocktail that surely comes with that umbrella. This lady working or hardly working at the food market in Dalat, Vietnam? Love that. I want her job. Thanks Gerard. Hey guys 🙂 OK here’s our entry this week… We spotted this guy during our stay in McLeod Ganj in India – The guy standing was a denture (false teeth) repair man! He had his hand shoved fully into this poor guys mouth – no gloves needed! Although it looks like it, he didn’t have his thumb in the guys eye socket! Thanks Stuart. It does look like the poor man is getting an eyeful as well as a mouthful. Why not take your work outside?! A pretty good place for a shave! Hi Sarah, thanks for the picture and welcome to Travel Photo Roulette. Where was this taken? Thanks Jsmes. Maybe not efficient but I’ll give them points for trying. The standing about/doing something ratio is actually pretty good here. Street food in Yogaykarta was not always easy to come by, but luckily for us this fine gentleman served up delicious, blazing hot noodles nightly. Not only that, but they were the cheapest game in town. We’ll never cease to wonder at what can be done with a simple terra-cotta pot filled with charcoal and an electric fan. Thanks Tony. The other half of The Working Traveller is a big fan of cheap noodles, maintaining that the most expensive isn’t always the best. If we ever find ourselves in Yogaykarta we’ll have to track this man down. Great job on winning the last round! Our entry is from one of the top lassi shops in Varanasi, India. It was a thrill to watch this man make the lassi drinks as he ground up and mixed in the toppings by hand using the method seen here. Thanks Jeremy. As your photo shows, along with most others here, there is just so much going on on the streets in Asia. This was from a snowy day in Zermatt Switzerland. Was walking through town and saw this guy getting ready for the work day. It’s not often you see a man pulling horses through the snow. I wonder what he does for a living? Thanks Anwar. After a long day volunteering in the coffee fields of Colombia I was left with about 10 pounds of coffee berries, after removing the fruit, drying, and roasting all that will be left is about a pound and a half of beans. It makes me appreciate my morning cup more than ever. I didn’t work for the coffee itself, but for the experience, to talk with, and at least for a day, be a coffee worker. My time in the coffee fields is one of my highlights on our RTW trip to date. Thanks for the picture, Adam. I just had a read of your coffee fields article as it occurred to me I had no clue, aside from a vague notion of beans, where coffee came from – but, then, I did think milk came from moo eggs until fairly recently. Sometimes the people making our food go UN-noticed, and under appreciated. Every night Moses worked his high heat gas burner with a smile that radiated near as much as his flame, I always made sure to let him know how good his food was and thank him. I caught this one with a fast shutter, just as he rolled the sauce back into the pan. Thanks Hannah, that’s the second photo submitted that has made me hungry just from looking at it (not counting the puppy and snake stalls in picture 14). Thanks for the invite to play along! Great theme and so many superb shots! I’m submitting this shot taken in Granada’s Parque Colon. After a day walking the streets of one of Nicaragua’s oldest colonial cities we sat in the central square to rest our tired feet and soak in a little more of the local culture. I sat watching this young girl selling her wares. She stood with such poise and took such pride in each sale. She hadn’t noticed us until the moment I took this shot when her gaze caught the lens of my camera. Thanks Ben, your entry came in a little after the deadline but that was only a guideline so I’m very happy to see your photo. I will add it above the line later. Besides this is the first entry that shows that not uncommon sight of children working. Ok, that’s it. No more entries please. Thanks to everyone who has sent in their photos. We have enjoyed seeing everyone of them and will be making our decision on the winner by Monday afternoon.